There are two main ways that you can test your election setup within Electionbuddy. The method you should choose should depend on what you're looking to test. The only option you have for testing the entire election setup. On the "Voters" page of your election setup, you can only have a five-person voter list. If you try to add more than five voters, it will not work. Test elections are free. If you're being asked to pay, please re-visit your "Details" page of your election setup to ensure that you have "This is a test election" selected (and be sure to scroll down and save the page). A test election is truly the only way to test your entire voting experience. You will receive an email notice exactly like your voters would receive, and you will go through the voting process in the same way. We have created a natural flow to proceed from test elections to your real election. Once you have found your perfect election setup via a test election, duplicate the setup to use the same setup for a new election. You will be required to review the setup, so you can make small changes if necessary. One thing to be mindful of is making sure you un-select "This is a test election" when working with a duplicated test election that you'd like to turn into the real election, or else you will not be able to add more than five voters. Your votes will count in your test election, so you will be able to interact with and analyze the results in the same way that you would for your real election. Best used when you: already know the election's main setup is correct, want a final opinion on the state of the ballot (ex. to ensure that candidate names are spelled correctly, or that you're allowed to only vote for the correct number of candidates), or want to show someone the ballot setup. Create and/or continue building your election until you reach the "Review" stage of your election setup. 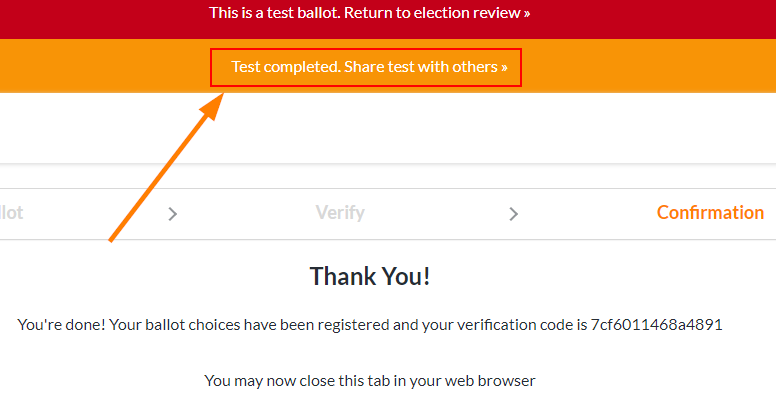 On the "Review" page of your election setup, your first requirement is to test the ballot. Test the ballot. Click on the orange banner (not the red banner). A window will appear, asking you to enter email addresses of up to five people to help you test the ballot (you will only see one email address entry field; click "Add more emails >>" to get four more email address entry fields). Click "Send Test Ballot" to send an email with a link to test the ballot to those email addresses. This is not the same as a test election: it only helps you test the ballot. Because the election is not running at the point when you test, votes cast when testing the ballot do not count in any election. The email that your testers will receive is not the same as the email notice your voters will receive in your real election. It simply informs them of what you're trying to accomplish, and includes a link to your ballot. If the testers do not receive the email, you will not be able to re-send it, so we suggest asking your voters to add invitations@mail.electionbuddy.com to their contact list to minimize the risk of them not receiving the email.